‘Mature animations’ have, rather unfortunately, rarely been a staple in ‘Western’ cinematic culture. ‘Mature’ has often been mistaken for ‘sexualised’ due to marketing ploys attempting to introduce the concept. Yet in ‘Eastern’ cinema mature animations have proved popular for exploring a variety of adult and socio-political themes, ideological explorations which would often require a vast budget in the live-action arena. Through his independent feature King of Pigs (돼지의 왕), writer/director Yeon Sang-ho (연상호) has produced an exceptionally powerful social critique of Korean culture. While the limited budget is at times visible and the acting occasionally over-zealous, King of Pigs is a stark and violent examination of patriarchal and hierarchical society, as well as the role of capitalism and corruption in defining one’s existence. As a struggling writer, Jeong Jong-seok (Yang Ik-joon (양익준) is continually frustrated in his attempts at becoming a published author. Bullied by his boss for daring to give an opinion over a piece of writing, Jong-seok has a violent encounter with his wife as a result. Storming outside to clear his head, Jong-seok receives a call from a childhood friend he hasn’t spoken to in several years, Hwang Kyeong-min (Oh Jeong-se (오정세). Meeting for dinner, the two old friends reminisce about their youth and the difficulties of living and studying in an all boys’ middle school. Yet the conversation takes a darker tone when the topic of their old mutual friend Kim Cheol (Kim Hye-na (김혜나) arises, and secrets long buried are finally revealed. 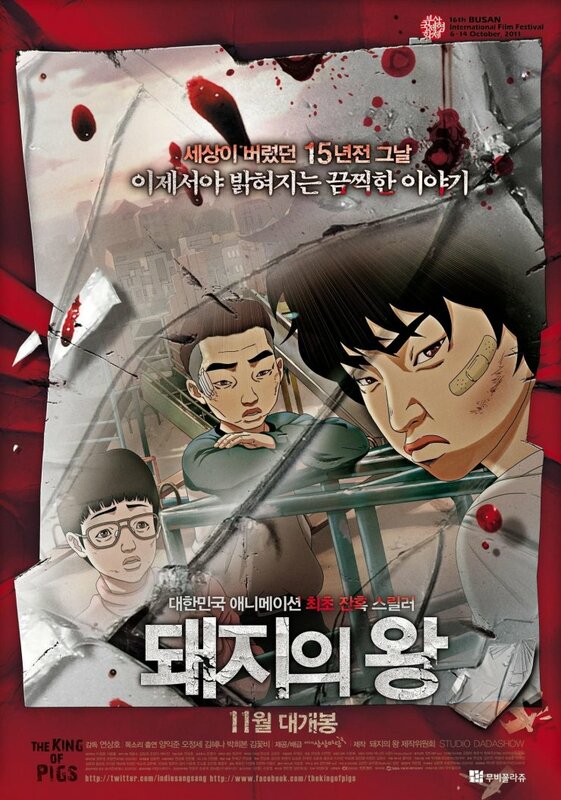 King of Pigs is an incredibly gritty, violent examination of the childhood years experienced by contemporary middle aged men, and pulls no punches in emphasizing the Confucian and capitalist value systems as the route of all evil in Korean society. 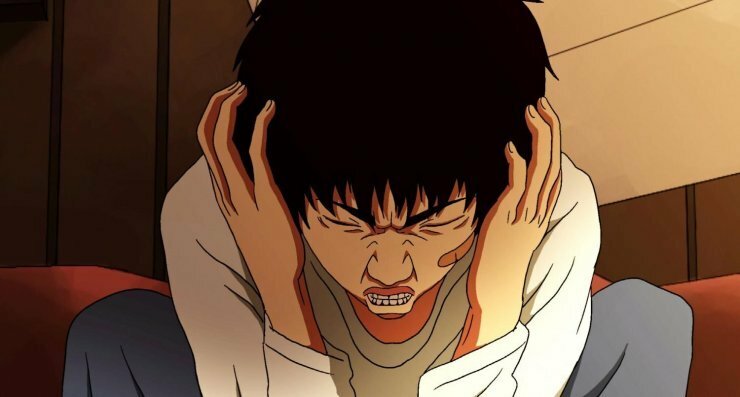 The narrative is one of the most powerful expressions of ‘Han’ cinema in recent years as the social injustice and inequality depicted provide the protagonists with palpable angst and rage, which director Yeon Sang-ho exploits by increasing tension to such an uncomfortable degree that violence is not only a prerequisite but a virtual demand. When it does transpire, the action is beautifully cathartic as the fluid animation and camera movement weaves amongst the kicks and punches as they impact the transgressors, as much a commentary on audience desire as it is on bullying. King of Pigs is a success largely due to such well-structured sequences and the shockingly compelling narrative as it jumps between Jong-seok and Kyeong-min’s childhood years and their adult lives. While the former certainly takes precedence the consequences are conveyed in the present, adding layers of depth as the protagonists’ formative years unfold. Indeed, it is remarkable just how many social discourses are contained within the film. While bullying is rife within all cultures, the tactics employed within this particular school are not only predicated on physicality but also in wealth, age, gender, social relationships and parental influence making King of Pigs a distinctly Korean affair as the hierarchy self-perpetuates due to its Confucian heritage. As Jong-seok, Kyeong-min and Chul have precious little of the necessary attributes they are cast to the lowest ranks of the school pecking order, and the resentment that evolves and festers is startling to behold. Yet the narrative is also concerned with the private lives of the three friends, which allows the conveyance of such concepts on a societal scale as they witness misogyny, crime and corruption as the people around them seek power only to abuse it. As frustration and resentment engulf the trio, they wish desperately to alter their role as merely a ‘pig’ in the hierarchy yet are tragically aware that such a role defines them for life. However, while the narrative of King of Pigs is strong and highly symbolic, it is not without problems. While it feels an unfair point to criticize, the limited budget does occasionally appear through the animation as characters move robotically in certain scenes, particularly in sequences where a large number of people enter the frame. This is in stark contrast to the fluidity of action scenes and the difference is quite jarring and somewhat distracting. The vocal talents of the cast are generally very competent and sincere, particularly by the actors voicing the protagonists as children. Kim Hye-na stands out in this regard as poverty-stricken delinquent Kim Cheol, who performs the array of poignant moments and aggressive events well. As adults the vocal talents have less significant screen time, yet Breathless director Yang Ik-joon conveys the tragic frustrations of Jong-seok especially well. There are moments however when the acting becomes over-zealous, notably with Oh Jeong-se as Kyeong-min who is at times is rather hysterical. Luckily the supporting cast and the strength of the narrative make sure that such moments are short-lived, as the film deftly focuses on the characterization of all the protagonists in both time periods. 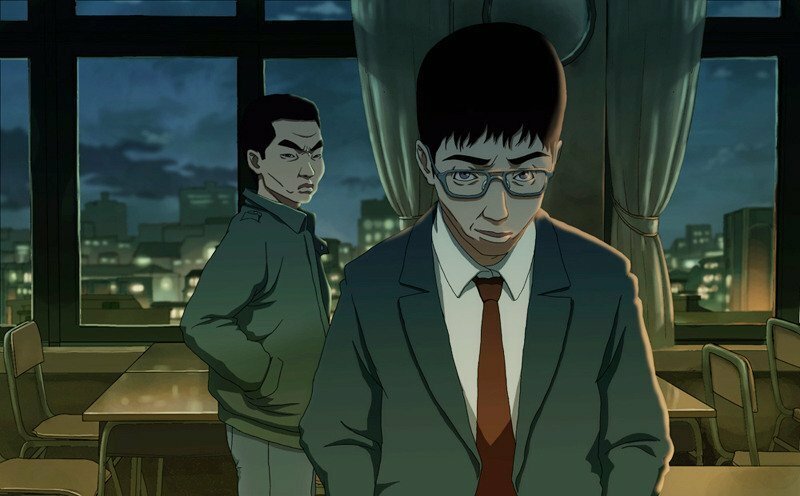 King of Pigs is a bold, unflinching animation that portrays an incredible examination of a variety of social discourses in Korean culture. Writer/director Yeon Sang-ho has crafted a well-structured and gripping narrative with incredible depth, where the stylized violence is not only naturalized but, through the build of tension, desired. 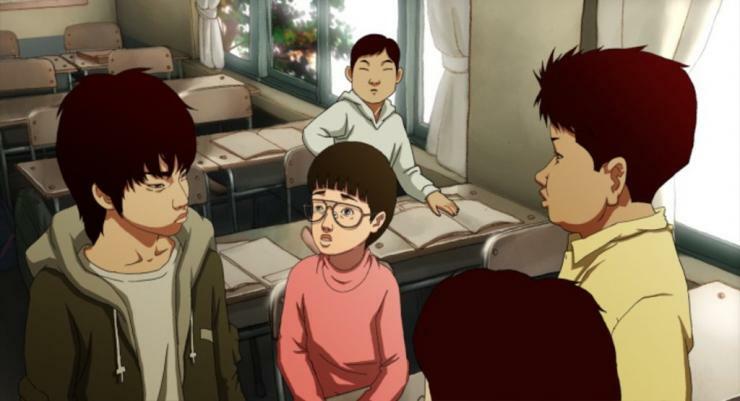 While budget limitations and over-zealous acting occasionally appear, King of Pigs is a riveting film not only in terms of the animation genre but, due to the uncompromising concept of ‘Han’ throughout, a compelling entry into Korean cinema.